Well placed lcd keypads ease the daily use of exiting or entering. Alphanumeric screens not only display the system's status, but give the user step-by-step instructions to guide through all operations. Multiple zones allow for accurate bypassing and reporting features. 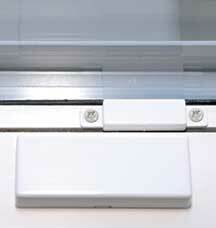 Door and window contacts detect the opening of areas that are included in the design of the alarm system. Discrete hard-wired contacts that are trunked to a main panel are barely seen by the homeowner, guests, or badguys. Slim-line wireless contacts utilize readily available batteries instead of propriatary manufactuers' brands. 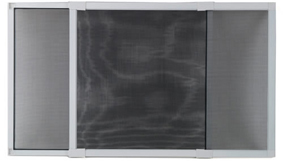 Wired window screens give the homeowner the capability of leaving a window open for summer ventilation, laundry and bathrooms, or pet areas while still having the alarm screen protecting your home. 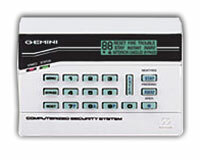 Custom fit per window and wiring schemes, alarms screens add to a complete alarm system. 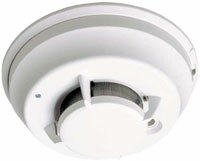 Smoke detectors provide 24 hour protection against fire when wired to main alarm panels. Smoke detectors are most well-served in sleeping areas or higher points in the home to guard against smoke travelling through the house. Near points of ignition, heat detectors watch for the rate of rise in temperature on protected zones. Exterior bellboxes not only give a visual warning that the home is protected with an alarm, but also loudly ring-out when an attempt has been made on the home. Interior sirens are placed inside the home and give-off a high, shrill noise that debilitates the intruder. Motion detectors watch for activity in protected areas. With dual-technology, false alarms due to environmetal air and heat fluxuations are filtered out. Pet-immune motion detectors,in proper locals, allow movement of pets up to 100 lbs. in weight.